Steelers Draft TJ Watt in 1st Round of 2017 NFL Draft. Is He “Unicorn” 3-4 OLB Pittsburgh Seeks? 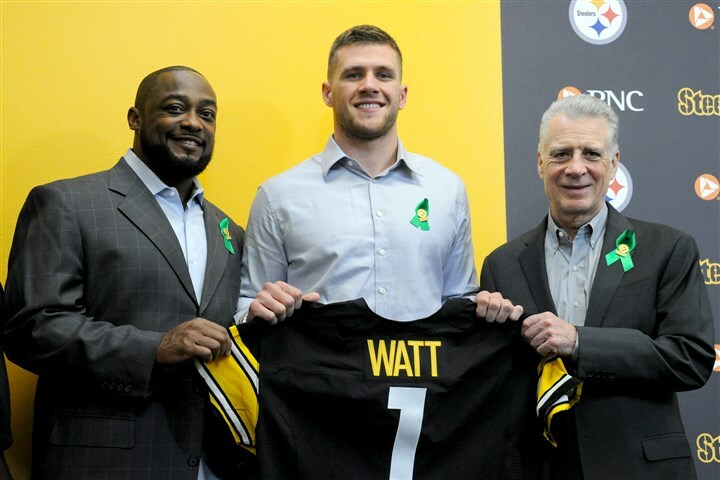 While it took an inordinate amount of time, especially for those of us who live 1 hour ahead of Eastern time, but Pittsburgh got its man in the 2017 NFL Draft as the 30th pick saw the Steelers draft T.J. Watt, Outside Linebacker out of Wisconsin. T.J. Watt is of course the younger brother of the Houston Texan’s JJ Watt. The Steelers are a hardworking organization that does it the right way. They have a great bond within the locker room and with the coaches as well. I am really looking forward to it. It’s a great fit for me. It will be a great transition coming from Wisconsin to here and that is why I am so excited. Based on TJ Watt’s highlights from his junior year at Wisconsin, the Steelers are excited too. You can be forgiven if you conclude that T.J. Watt brings an extensive resume to Pittsburgh. He doesn’t. After sitting out his Red Shirt Freshman year at tight end, he moved to defense, and then had difficulty making the transition to defense, only playing 8 games as a sophomore. However, his junior year was impressive, as he recorded 11 sacks, 15.5 tackles for a loss, and made 63 tackles with one interception. T.J. is a rock solid young man who has a lot of upside. He doesn’t have a lot of experience at the position, but at the same time we saw some things that were exciting to us. His hand usage in particular for a guy with his short resume at the position was exciting. His production speaks for itself. He’s just a quality guy and a quality pick for us. Although several names mocked to the Steelers were gone by the time they picked 30th, In picking Watt, the Steelers passed on an number of cornerbacks who will probably no longer be there late in the second round. Is T.J. Watt the “Unicorn” OLB the Steelers have Been Seeking? While outside linebacker, or “Edge Rusher” was seen as a major Steelers need heading into the draft, a strong sentiment existed that favored the Steelers drafting secondary first (pun intended), given edge rushers are not as effective against quick release quarterbacks. What has changed, however, is that the Steelers play in their base 3-4 defense less and less frequently. That has led some writers, such as Steel City Insider’s Jim Wexell, to suggest that the Steelers abandon their search for a quality 3-4 linebacker, who can rush the passer, set the edge against the run, AND drop into coverage and focus on getting a player who more closely matches a 4-3 defensive end. This guy might be the unicorn they’re looking for at outside linebacker. Watt still has the frame to put on another 10-15 pounds, and with only one year of playing defense, his upside is tremendous. The knee injuries prevent me from putting him first on this list, but I’m hearing the Lions, Cowboys, and Packers are all showing heavy interest, so I’d be surprised if he makes it to pick 30. That’s something I’ve been doing at Wisconin [sic] these past two years and I think that’s why I translate so well to the (Steelers) defense. I’ve shown on film I can play a 3-technique if I really have to. I can set the edge really good, and I can get after the passer. I think that’s ultimately what makes a really good football player and I think having great players around me is what’s going to make us a great team. And so it is. Four years ago the Steelers went down this route in their first attempt to replace James Harrison when they drafted Jarvisy Jones with the 13th pick of the 2013 NFL Draft. As we know, the Jarvis Jones experiment failed miserably. Jarvis Jones had a great college track record, but poor mesaurables. In contrast, T.J. Watt seems has measurables but not a lot of college production. So the Steelers are taking the opposite tact in trying to replace a man who is irreplaceable. Let’s hope they have better luck. Welcome to Steelers Nation, T.J. Watt. This entry was posted in Steelers 2017 off season, Steelers Draft and tagged 2011 NFL Draft, 2013 NFL Draft, 2017 NFL Draft, Cameron Heyward, James Harrison, Jarvis Jones, Mike Tomlin, Pittsburgh Steelers, Steelers linebackers, T.J. Watt. Bookmark the permalink.